Ça fait longtemps que j’ai écrit en français. Donc, j’ai décidé de le faire de temps en temps ici, dans mon blog. Cet article est dédié à mes amis français. Plusieurs citations revendiquent que c’est le meilleur travail si notre passion et la profession sont les même. A notre époque où la profession est une source essentielle d'une meilleure vie, je ne pense pas qu’il y ait aucune vérité dans eux. L’origine de cette pensée se trouve dans une discussion que j’ai eu avec mes amis à propos de la popularité des écoles internationales. Un article partagé par mon ami parle de ces nouvelles écoles qui sont devenues très populaires en Inde. Avec une nécessité de produire les meilleurs élèves, ils essaient toujours d'attirer de bons professeurs. A la suite, le salaire des enseignants est augmenté. Pourtant, il y a un autre côté de ces écoles dont l’article ne parle pas. Beaucoup d’entre eux paient les enseignants en retard et moins de salarie que promis. En plus, à partir de l’enseignement, ils leurs font faire le travail de Romain. Ceci a posé une autre question pour nous. Quel type de travail nous fait trimer? Est-ce que le mariage de passion et profession assurent un travail idéal? Je suis certainment contre ce mariage. Je peins quand je voudrais le faire. Je voyage où je préfères d’aller. J’écris de mes intérêts. Si, je dois peindre comme un travail, ma créativité va toute de suite mourir. Ce devient donc un effort obligatoire. Si je dois voyager avec une date d’achèvement et des attentes, je ne crois pas que je l’aimerai. De même que pour mon écriture. De plus, une profession vient toujours avec une nécessité de l’argent, le temps limité, un chef ou, si vous êtes entrepreneur, avec des pressions immenses. Ceci me fait penser si ma passion restera la même si je la convertis comme ma profession parce que, la liberté est la seule chose qui stimule la créativité. En outre, mes loisirs ne sont pas à vendre. Mais cela dit, je voudrais indiquer que j’aime aussi mon travail. Ma métier n’est pas nécessairement ma passion. Pourtant, il y a des aspects de mon travail que j’adore et je voudrais les découvrir profondément. D’ailleurs, ma profession me donne l’argent que je peux utiliser pour développer mes passions. Ainsi, mes loisirs ne sont pas gérée par quelqu’un d’autre. Autrement dit, ma passion n’est que la mienne. Donc, je pense que c'est nécessaire que votre travail vous passionne, mais le contraire n'est pas nécessairement vrai. Alors, la question demeure - Quel type de travail nous fait trimer? Selon moi, ils sont les travaux auxquels je ne crois pas. Et, pour vous? When I met my nephew Vibhav earlier this year in the US, we talked a lot about his favourite animated movies and superheroes. While browsing through one of his comic books, I promised him to create a painting for him. And there was no other perfect time to gift him the same, than on his birthday this August. I had the initial sketch ready long before I actually started painting. Then it waited on my easel like all other paintings do for the mood to hit me. One day, I forced myself to start the colouring. 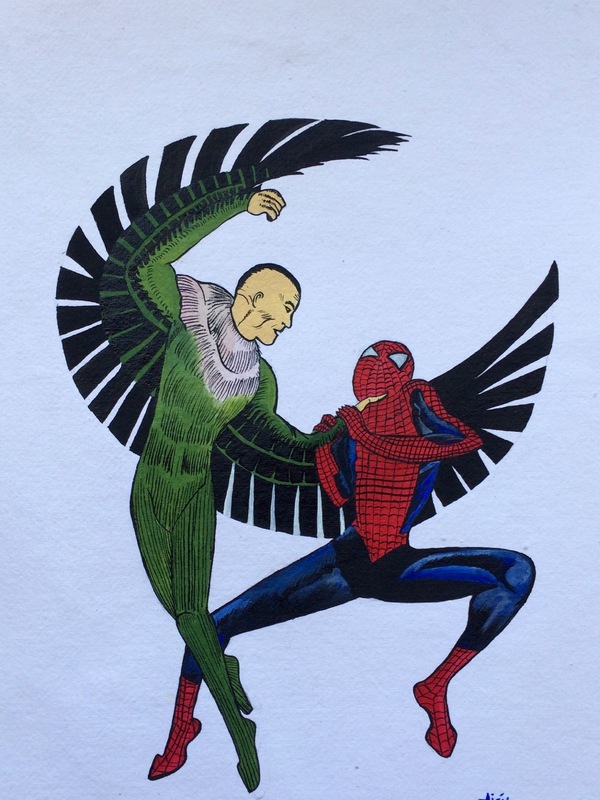 With my past experiences with colours, I chose Acrylic for its brightness and applied the base colours on the two characters - The Spiderman and the Vulture. Again the painting waited on the easel to be continued for a perfect day and time. And, then one day within a matter of 4 hours, it reached its intended destiny. 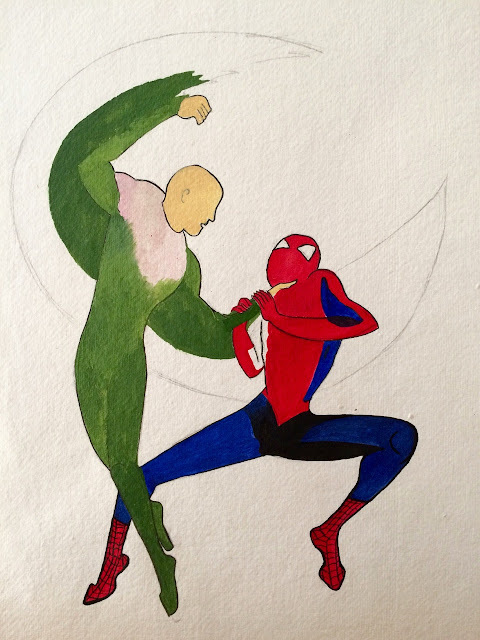 I completed the spiderman first with the details and actually loved how the shades on the pants turned out. It is very rare that I am happy with my own work. I wanted the superhero to be more attractive in his dressing than the antagonist like it usually is. I also loved how the initial bright blue acted as a base to this final texture. But everything had to be quick as acrylic dries faster. I also had a perfect atmosphere to complement my mood. 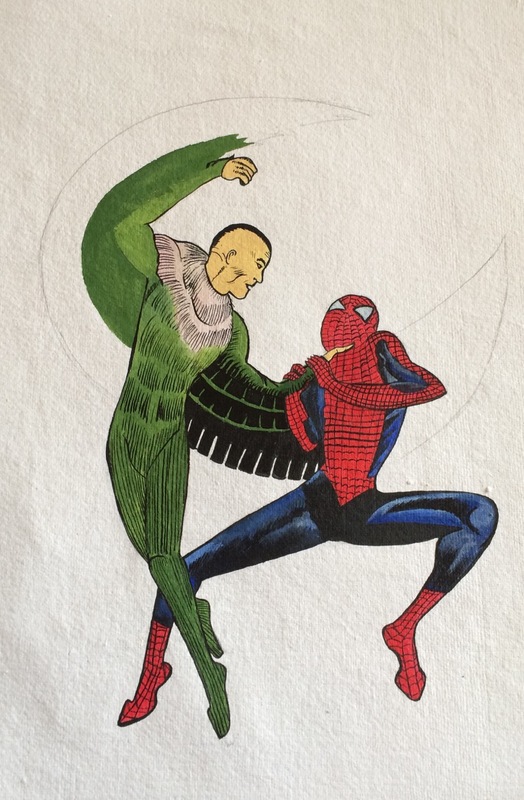 For the vulture, I used little white to give a rather dull shade. 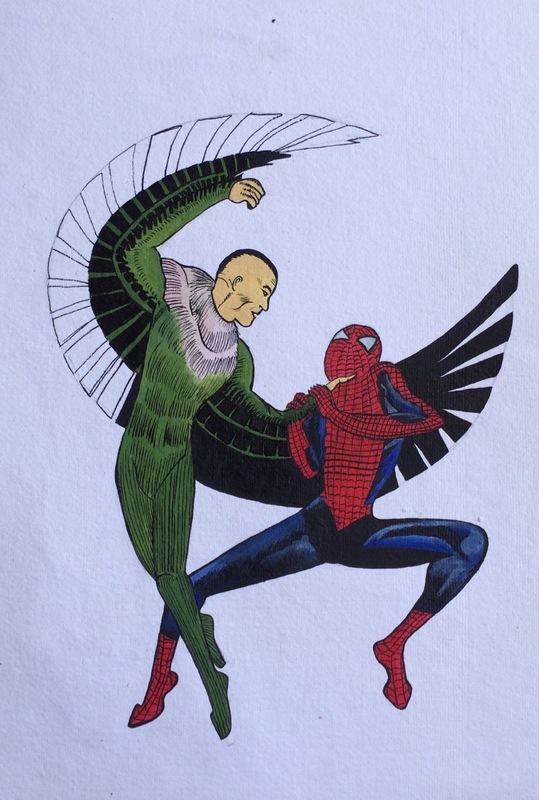 There was not much detailing on his costumes, so it turned out to be quicker. The challenge though was to retain my patience to complete the feathers of the wing. I tried to do them individually. But then thought, I could cheat by creating a thick band of black and white stripes on them. However, I realised soon enough that it would not work out well. So, continued painting every single strands of the wings separately. 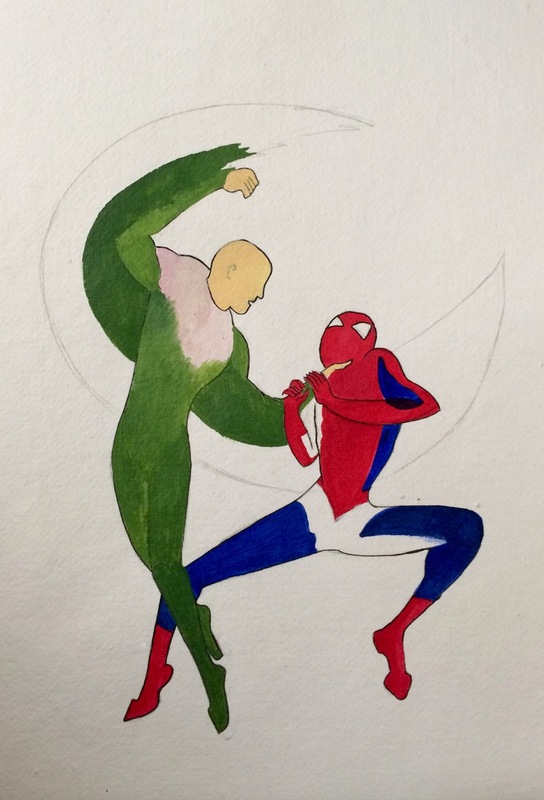 And then, the painting was complete. I had to force myself to look away because, there is always some more detailing to do. The spiderman was all set to struggle his way through to become triumphant. Victory does not come easy, but what is important is to not stop believing in oneself... like all those superheroes. Spoilers ahead!!!!! If you have not watched the film and wish to watch, please do so before continuing. My father had a step brother. He was fourteen when he ate an over ripe Palmyra fruit and succumbed to severe diarrhoea and vomiting. Within two days, on a new moon day, (Amavasya) he died. He was known to be very passionate about the hectares of land that my great grand father owned. My father was only a child when my uncle passed away, so I obviously did not meet him but my uncle’s story always resurfaced in discussions that my mother or grandmother had. When the family faced troubles, my mother went to the astrologers and they would remind us of this untimely death in the family that could be decelerating progress. It was hence decided that he be given Moksha (Salvation) through proper rites and rituals. Apart from other snake related sins, the astrologers would also point out our ignorance towards the Bhoota Aradaney (Worship of holy spirit) in our ancestral house. As a reparation, my mother undertook on herself the task of regularly offering jasmine flowers to the holy spirit. I have always argued with my mother about the numerous rituals that people in South Canara bond themselves with. Sometimes, for her happiness, I have taken part in those rituals but most of the times, she let me be. Now that I have been away from my hometown for a long time, I am mostly disconnected with those customs. Recently, when I watched the movie Rangatiranga, I was reminded of my growing up years in Dakshina Kannada and it brought back the stories of sins, snakes and ghosts that dominated my childhood. 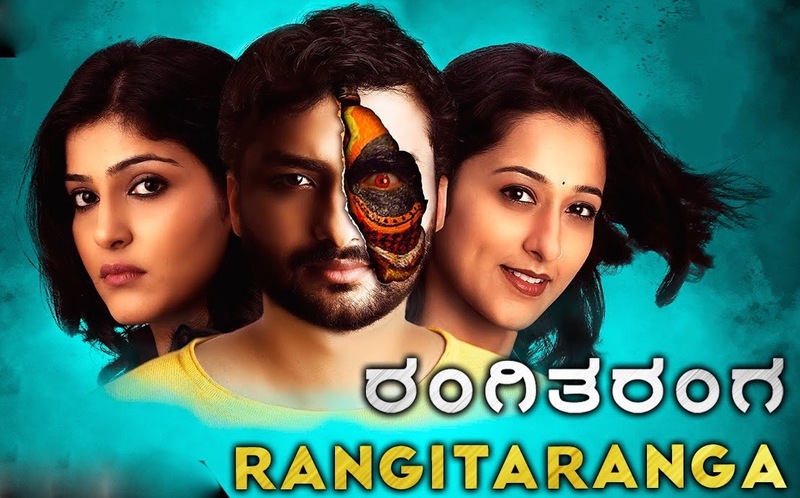 The movie Rangitaranga has a very captivating story line. Two stories run in parallel - One, a couple traveling to their village in South Canara in order to perform an offering to a holy spirit, witness supernatural happenings. In another, a journalist is in search of the identity of an anonymous writer. When the two stories meet, missing answers to the puzzle unravel. The movie takes inspiration from a very popular TV serial called "Guddeda Bhoota" that narrated a story of superstitious beliefs surrounding a ghost. Growing up in Mangalore, my childhood was filled with stories about holy spirits, ghosts and Brhama Rakshasas (An unmarried Brahmin soul that has not parted earth). My grandmother always had interesting stories of how her brother’s children died of what she referred to as Ghost attack but, the description sounded to me like epilepsy. Guddeda Bhoota too is a very common term used in the region. Before we proceed with this term, it may be helpful if I clarify the words Gudde and Bhoota. Bhoota means ghost. Mostly in Mangalore, it means a holy spirit, often of common men who have elevated themselves to this position through a heroic act and are believed to have gained Godly powers after death. Some holy spirits also draw references to animals and others are believed to be Ishwara Ganas (Representatives of lord Shiva). There are three types of holy spirits - The one at home, for the welfare of the family. The one that safeguards the land and the one that protects a village (Grama). Bhoota Kola is a way of offering food to the holy spirits which involves a Pambada (One who dresses as ghost) becoming possessed by the holy spirit. If Bhoota Kola is not performed every year, it is normally noticed as a bad omen and become a reason for all the unfortunate events to take place in the family or village. My mother and many others I know, claim to have heard sounds of anklet around the house during night. I have often argued with my mother that it must be an insect. A vivid memory of a Bhoota kola haunts me. I was a kid and had gone to witness a Kola in our ancestral home. When the Pambada arrived, I had to hide behind the elders. As a grown up, I noticed how heavily drunk the Pambadas were before the act and heard of talks that claimed that they probably faked their possessed state. Also shocking was to hear about how the day after the Kola, they drank blood of a rooster. With these revelations, my perspective about this whole affair changed from being a supernatural phenomenon to a mere form of art. Nonetheless, I remain fascinated by the makeup, costumes, music and dance involved in this act. 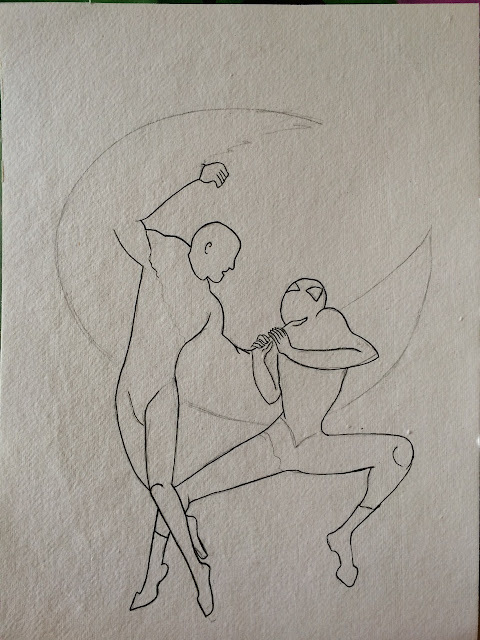 However, Angara’s ghost referred in the film normally tend to be of those who have had a sad end to their life and their spirit has not parted earth. Their unfulfilled desires are believed to be the motivators to their actions of scaring and attacking humans. A similar myth forms the crux of the movie. Gudde means a small hill. Midst the agricultural land there are unused, uncultivable lands that are generally used to graze cows and are termed as Gudde. Children are denied playing or going to the Gudde alone, specially during noon. It was said that the ghosts would throw sand on us and for some reason it was considered bad. At times, I ignored these warnings and played often in our Gudde. Occasionally, when I was alone, the fluttering of leaves and swirls of sand on the ground made me run back home out of fear. Thus, Guddeda Bhoota is a very common term used in South Canara which was then popularised by the TV serial. It was very impressive of writer/director/music composer Anup Bhandari to link this story to the serial by not only using the plot but also utilising its famous title song in Tulu Language that speaks about the existence of a ghost in the hills of a small fictitious village called Kamarottu. The real hero of this movie is undoubtedly its story. To write a story that captures the interest of the viewers and pay attention to the details do not come easily. Anup Bhandari does more than justice in packaging a story that is mysterious, emotional, comic and sensible all in right proportions. As a writer, I was excited about how the story misleads the audience during the first half to concentrate on the ghost rather than on the real twist about the couple's identity. An unexpected twist does not seem like a force fit here but explicates the complexity in the personalities of the main protagonists. However, there were a few scenes in the beginning that forcibly tries to scare the audience in an untimely fashion. The story has been chalked out with logic that requires the writer to pay extra attention to the specifics but the beauty is that all these details are subtly included. For example, the reasons why Harini does not want to be seen by the public, relationship between the house maid and Garnal babu, the reasoning for the kidnaps and murders and why Indu takes a journey back to the village. The scene where TR bhat asks his wife whether it was Angara’s physic, his looks or his makeup that attracted her the most, is very dramatic yet sensible considering the artistic nature of the one who questions. Well, this is also not unheard of in Mangalore. 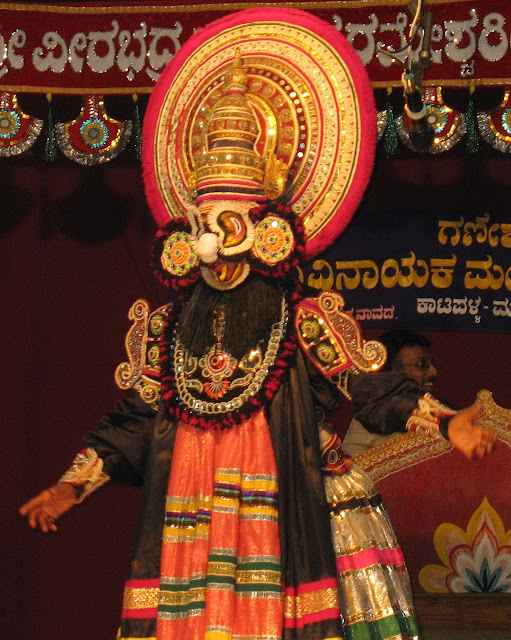 Many women have found themselves attracted to the Yakshagana artists for how they present themselves or talk on the stage. Several artists masterfully deploy this talent in wooing a woman. Although, not every detail in the movie is appropriate. The Ghost wore an anklet worn in yakshagana instead of wearing a "Gagara" that actually makes the scary sound while it walks (Sound that is heard throughout the movie). 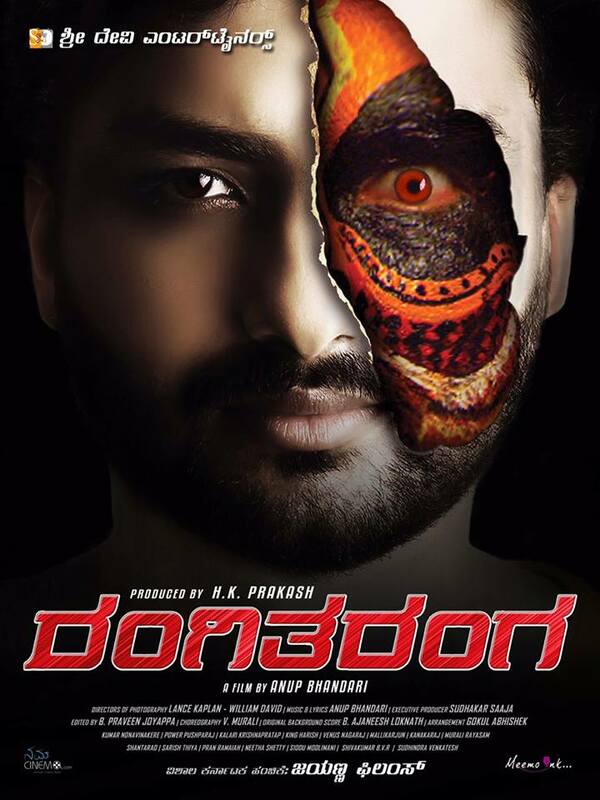 The costume and makeup of the ghost in the movie drives inspiration from yakshagana and Theyyam more than that from Bhoota Kola. But, it may be overlooked considering creative liberty. There is a lot of information in the story and a good editing could only have maintained a crisp narration. However, a downside of this is that some scenes that could grab attention like, the details of Bhoota Kola, Yakshagana and the Yakshagana style fight sequence in the end would also get cut short due to which the whole story of Guddeda Bhoota comes to an abrupt end. Specially felt by me, as the scenes of Yakshagana and Kola took me back to my days in Mangalore. I recollect several such incidents where as a child I was scared to death walking back alone after having watched a late night Yakshagana at the temple. As I returned home at those ungodly hours, I was reminded of the stories of ghosts, snakes and the demons from the stories enacted in the Yakshagana. 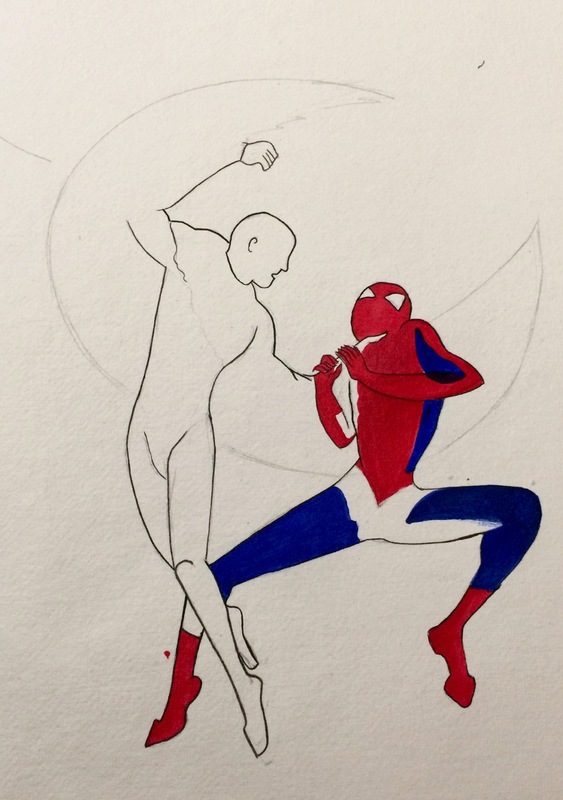 Being an artist, I was drawn towards the effective use of colours in the movie. Orange and black appears to be the theme of the film. 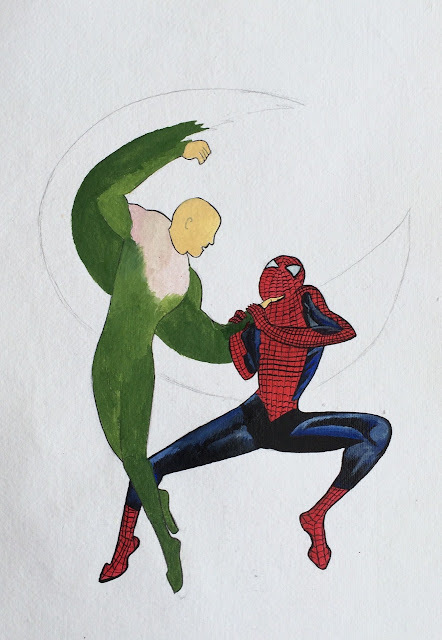 They are the primary colours on the ghost's face and is also effectively used over the hero to firstly arose suspicion and secondly draw a metaphor of dual personality. 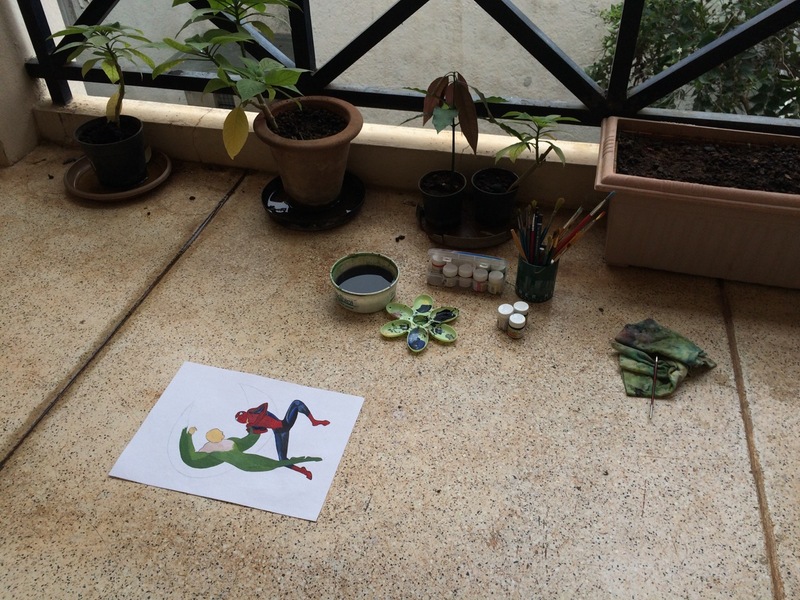 But the most beautiful use of colour and symbolism I found was to represent Sandhya’s love. She is often seen in colour red representing a need for love. She holds a red umbrella as a symbol of their love which is seen handing over to each other or acting as a shelter to the two during a rain. In the climax, she wears blue displaying her mood and a red blanket is seen over Indu. I may go a step further in imagining that perhaps Sandhya was the one who held that umbrella when she first met Siddharth. South Canara and Malnad have often attracted attention for its picturesque locations. The cinematography brilliantly captures the beauty of the locations. Specially the Aerial shots of the ambassador car under rain, the couple walking to the police station under a red umbrella, rain drops dripping from the jeep roof and elegantly choreographed and shot song Nee Kele vadhuve draw attention. Additionally, the songs are very creative. I specially like the remix version of Gudeda Bootha title song and the song "Kareyole" with every word of the song starting with the kannada letter "Ka". There is also one with tongue twisters and another drawing inspiration from yakshagana style of singing. When it comes to acting, the lead actors, in spite of being debutants or rather new to the industry have given exceptional performances. Radhika Chetan as Indu is impressive and Nirup as Gautam suits the role perfectly. But bound by the script, their acting does not vary much throughout the film. I specially liked the acting of Avantika Shetty as Sandhya as hers is the only character that has the opportunity to display varied emotions including humour, liveliness, wit, romance, helplessness and sadness, which she delivers with spontaneity and ease. I liked Sai Kumar’s acting too which he very neatly underplayed. Also, his personality closely resembles a Baghvatha (The lead singer in a Yakshagana performance). The way he speaks referring to songs from Yakshagana is very typical. My father, who is a Yakshagana artist always has friends from his circle come home to discuss various themes. Several times, I have heard them sing a particular verse from a song while discussing mythological themes that Yakshagana is usually based upon. However, even though I did like Sai Kumar’s acting, I also felt that his attempt to speak South Canara accent was less impressive. Even worse was the actor who played the School head master. Nevertheless, a lot of attention has been given to choose appropriate actors for pivotal supporting roles such as that of Rafiq, Angaara, Garnal babu and Pandu. The actor who played the inspector though showed required aggressiveness that the character demanded, was a little too loud and unnatural. Karthik Rao as Rafiq undoubtedly gives the best moments of humour in the film with his South Canara accent and expressions. Without any speech, Dinesh Siriyara as Angaara gives a memorable performance. He very well displays his isolation and confusion within a short span of time. Thoughts of Angaara and his isolation takes me back to my initial topic of beliefs and rituals in South Canara and my disagreements with my mother. Despite our difference in opinion, my mother and I stay united. She understands that I don’t believe in these rituals or thoughts and I understand that she need not change her beliefs for that reason. She has lived in Mangalore all her life surrounded by these faiths and rituals and most importantly, her beliefs give her comfort. But for me, I have always wanted to escape this part of my hometown. Despite its cultural richness that I greatly appreciate and am constantly inspired by, Dakshina Kannada also has a side that I don’t necessarily agree with. I am forced to bring my thoughts back to Angaara again. As the movie ends, it is not Anasooya or Sandhya whom we feel sorry for but it would be Angaara. His death was unanticipated. With a short description of him in the movie, it is clear that he was isolated from the society. He probably did not find any peace being alive but sadly, he did not find it in his death either. The same society that excluded him turned him into a monster who kidnaps and kills women. And here my thoughts return back to my uncle. I fail to find a logical reason why he must be blamed for all the misfortunes. The past is important for us to analyse what is right or wrong but, it is also important to know when to let go of it. And thus I conclude with the last dialogue from Sandhya to Gautam in the movie which more or less means - "Do not try too hard to dig your past, your present is more beautiful, go live it!"